It’s been a while since I’ve managed to post. Lots has been going on, some of it only tangentially related related to archaeology. I started the year with a partial right knee replacement, which led to lots of PT. It turned out I had a loose piece of bone the size of an acorn floating around in my knee, according to my surgeon. Getting that out was a huge improvement, but I had to do a lot of PT to get to a point where I can kneel if necessary for excavation. I’ve got about 0-132° range of motion, so I can kneel now, although it isn’t pleasant to do it for a long time. A few weeks later, I gave a paper at the Alaska Marine Science Symposium in Anchorage. I was able to talk about Patou the mummified seal and the long-headed bear, to an audience largely composed of oceanographers, marine biologists and the like. It was a great venue to raise awareness of the potential for archaeology to add time depth to research in other disciplines. Unfortunately, I had to spend most of the meeting in my hotel room icing my knee, so I missed a lot of the other papers. After that, there were the Alaska Anthropological Association meetings in Anchorage, where I organized a session on Accelerating Environmental Change Threats to Alaskan Cultural Heritage: Emerging Challenges and Promising Responses, which involved both papers and an open discussion. I gave a paper in that session and one on Walakpa in a session on Alaskan coastal archaeology. Next up was the Society for American Archaeology meetings in Washington DC. I took over as chair of the Committee on Climate Change Strategies and Archaeological Resources (CCSAR). I gave a paper, in the “Burning Libraries” session sponsored by CCSAR, and was also a discussant for a session on climate and cultural heritage. Once I get the PowerPoints properly annotated I’ll put them up on-line. A month ago, I also had retinal and cataract surgery, to resolve a retinal pucker that was blurring and warping the center of my visual field in my right eye. The surgeon says my vision should improve over several months, but it already has improved considerably, since lines now look straight to my right eye! I just had a one month followup visit and the doctor said I now have a foveal pit (which you are supposed to have, but which had been absent pre-surgery). Anyway, I can see much better. I’ve also been working on a whole bunch of articles, some coauthored with various colleagues and some that I am sole author on. I’ve also been working on several proposals. All that made for more than enough writing, which perhaps explains the silence here. I’m going to be spending a good part of the summer in the community of Kaktovik monitoring the remediation of the old Air Force hangar, which contained some materials now known to be hazardous. They are being removed as part of the demolition process, and even some of the soil around and under the hangar will be taken away. That’s where I come in, since the hangar was built before most cultural resources protections were in place, and there is a chance that it was built on top of an old site. Most likely there will be nothing archaeological there, but at least if there is we should be able to identify it and deal with it properly. I had hoped to be able to get back out to Walakpa this summer, but that is not looking too promising. The Kaktovik project falls right into the period when volunteers are available. Plus the schedule is ever-changing as the remediation progresses. It might not have worked anyway, since we had a VERY snowy winter, followed by a chilly spring. As a result, the site is still covered in lots of snow. 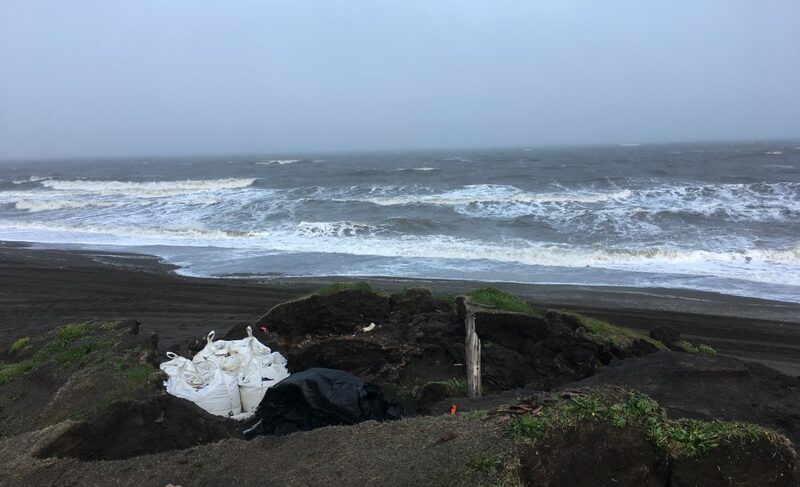 People who have been down recently say nothing of our excavation can be seen due to deep snow, and they can’t tell if the site was damaged by the big fall storm that resulted in a disaster declaration for Utqiaġvik (Barrow). At the rate things are going, if we were planning a field season, we might wind up stuck in the lab for half of it. Posted on June 21, 2018 by Anne JensenPosted in Archaeology, Arctic, field, global change effects, heritage, science, WalakpaTagged #climate_heritage, Alaska, Archaeology, Arctic, field, fieldwork, science. Next Next post: Antiquity article out! Anne, you always leave me breathless! I always look forward to your reports. Stay well! I always enjoy following your work. Glad to hear that you are on the mend!